A Map of the Countries Thirty Miles Round London. 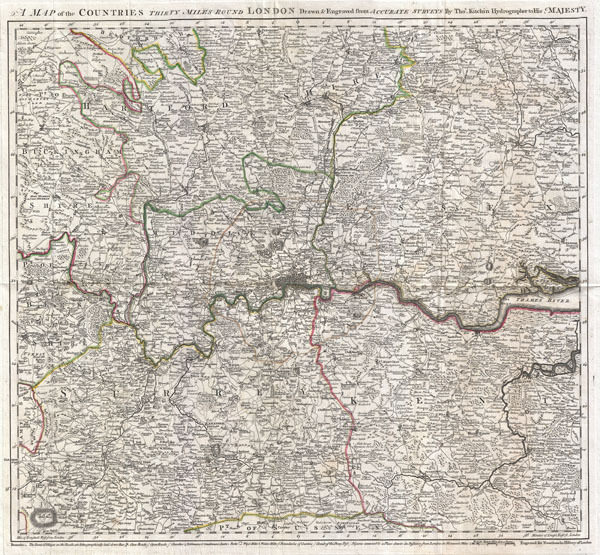 An exceptional example of Thomas Kitchin's 1773 map of the area 30 miles around London. This map was issued to accompany John Norrthouck's 1773 New History of London. Centered on metropolitan London, this map covers from Berkshire to Canvey Island and from Bedfordshire to Sussex. Offers stupendous detail showing roadways, parks, churches, the seats of various gentlemen and noblemen, wind and water mills, and regional political boundaries. A dotted line around London identifies the circuit of the Penny Post. David Smith, in his Map Forum article on 'The Communications' Mapping of British Towns' suggests that the Penny Post Circuit first appeared on maps of London in 1782, but this map precedes it by roughly 9 years, making this one of the first known to address the Circuit of the Penny Post. Relief shown in hatchures. Thomas Kitchin (August 4, 1718 – June 23, 1784) was a London based engraver, cartographer, and publisher. He was born in London to a hat-dyer of the same name. At 14, Kitchin apprenticed under Emanuel Bowen, under whom he mastered the art of engraving. He married Bowen daughter, Sarah Bowen, and later inherited much of his preceptor's prosperous business. Their son, Thomas Bowen Kitchin, also an engraver joined the family business, which thereafter published in Thomas Kitchin and Son. From 1858 or so Kitchin was the engraver to the Duke of York, and from about 1773 acquired the title, 'Royal Hydrographer to King George III.' He is responsible for numerous maps published in the The Star, Gentleman's Magazine, and London Magazine, as well as partnering with, at various times, with Thomas Jefferys, Emmanuel Bowen, Thomas Hinton, Issac Tayor, Andrew Dury, John Rocque, Louis de la Rochette, and Alexander Hogg, among others. Kitchin passed his business on to his son, Thomas Bowen Kitchin, who continued to republish many of his maps well after his death. Kitchin's apprentices included George Rollos, Bryant Lodge, Thomas Bowen Kitchin, Samuel Turner Sparrow, John Page, and Francis Vivares. Noorthouck, J., A New History of London, 1773. Very good. Original fold lines. Blank on verso. Original plate mark visible. Howgego, J., Printed Maps of London circa 1553-1850, 110-3. Smith, D., 'The Communications' Mapping of British Towns,' Map Forum, volume 1 - 12.